WishSoup — our client’s Facebook application — had some problems with User Interface (UI) efficiency and its overall design, which looked a bit outdated. They needed a new, fresh look to make the application more attractive while keeping in mind the goal of a better User Experience (UX). 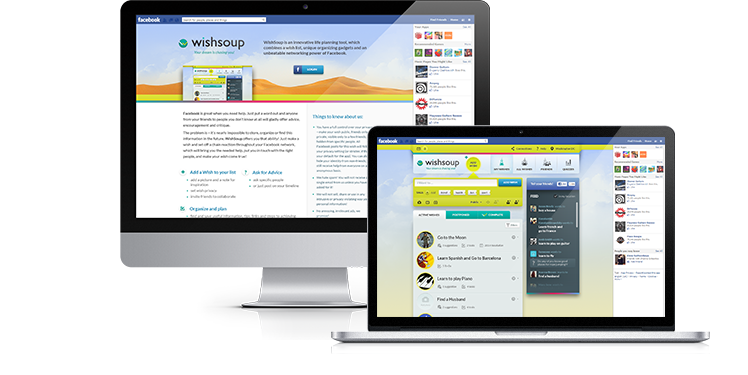 WishSoup is a virtual wish list available to your friends on Facebook. It can literally make your wishes come true by bringing you real help and putting you in touch with the right people. The expected design was planned to be catchy, but simple and clearly rendering the idea of this application. Our goal was to simplify the UI and make all the icons more functional and eye-catching. We created screens for every page, changed the background multiple times and paid attention to every little detail of the design. We’ve updated this app and now these 8 pages, 32 interface elements and 10 pop-ups look perfect, making it an experience you’re encouraged to share with friends and help fulfill their greatest wishes!